Property 27: Apartment in villa lido salus 4/8 people. 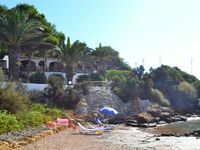 The house has a very good view to the sea and the privat beach is very calm and close (30-50m). It is full equipped. The owner is really pleasant and helpful. Our family (2 adults and 2 little children) had a wonderful holidays there.